Joe's back from Australia! And with a little prodding from his friend DG, he even played in B1 last night. Welcome back, Joe! And yes, you read that right, Count Chromatic was in the house, though come to think of it, he didn't play his chromatic last night. Well, still killer stuff on diatonic from Dennis Gruenling who's in town playing with Nick Moss. Being part of Nick's band these days means he's on the road a lot, so watch his calendar for gigs near you and check him out...or go here and sign up for his email list. We hear people on this list get special merch offers from time to time, so you may want to sign up! Final Take updates - Al's mixing things now so you should be getting your December recording soon. And if you're in the Performance Class, we record this session on February 26. Choose your song and begin workshopping it in class soon. "Until now, the only way to get resonator “cup mute” effects was to raid the kitchen cabinets for cups, mugs or used tin cans. I wanted something better." 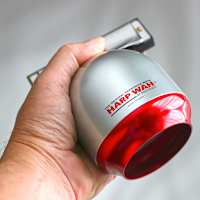 Check it out and get yourself a Harp Wah on the website.